Find Sheila E. at the Golden Nugget. 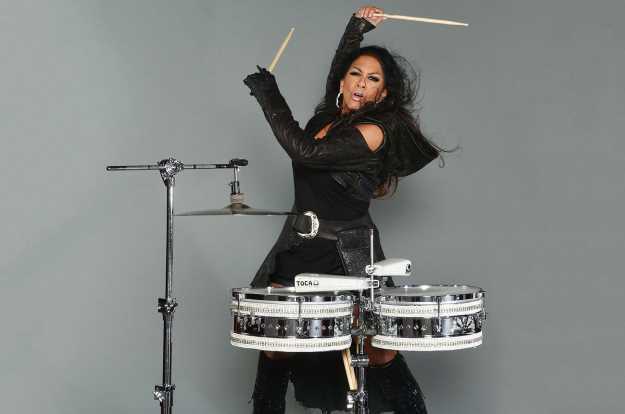 Percussionist extraordinaire Sheila E. may be best known for 1980s hits “Glamorous Life” and “A Love Bizarre” and for her longtime connection and collaborations with Prince. But the Oakland-born artist has also worked with legends like Ringo Starr, Marvin Gaye, Herbie Hancock, Diana Ross, Lionel Richie, Gloria Estefan and more and she truly does it all as a singer, songwriter, multi-instrumentalist and producer. She added another astounding achievement in September when she released “Iconic: Message 4 America,” a musical call to action that landed her back on the Billboard Albums chart for the first time since 1991. Since she’s performing at the Golden Nugget this weekend, I took the opportunity to speak with Sheila E. about the album and how important it is to her, and how her fans are reacting to such a politically charged piece of work. We just saw you on “American Idol” for the show’s Prince episode. How much fun was that? It was a lot of fun and it was an important thing to do, too. Everyone wants to do Prince songs and is inspired by him and no one is trying to replace him — because you can’t — but we have to keep taking the chances to continue his legacy and celebrate it, to teach the next generation what that is. I’m really glad “American Idol” did that. If we don’t educate about him and continue to celebrate him, then people will forget and it all goes away. He’s done so much. It would be a shame for people to not remember all the great things he left us. And you were in Las Vegas right before you did “Idol.” Did you catch a show last time you were in town? I love Vegas. I have family there and I love to get in and out and see shows, from Cirque do Soleil to newer ones. I saw Earth, Wind & Fire [at Venetian] but before that I saw Ricky Martin, who puts on a great show. I love his songs and that theater he’s performing in, you don’t even realize it’s a theater because he turns it into one gigantic club. Everyone is partying, singing and dancing and that’s what you want music to do. Is it true that you were working on the “Iconic” album before the 2016 election? It was a couple years prior that I started a project called “Politically Correct.” I knew the record I wanted to write many years ago but I thought it would take at least six months to put it together because the lyrical content had to be pretty deep. But then everything happened so fast. I was mourning Prince and then I was mourning our country, with the way the election was going, so I realized I had to put something out right away. And so I started thinking about the songs I grew up listening to in the ’60s and ’70s, great songs that were so relevant for that time and again today with what’s happening now. And so “Iconic” is a collection of curated covers of songs like “Come Together” with Ringo Starr and “Everyday People” with Freddie Stone from Sly & The Family Stone and “Pusherman” by Curtis Mayfield. Right. “Pusherman,” today, that pusherman is the drug administration. We are addressing things that are happening immediately with these songs and paying tribute to those artists. We did “One Nation Under a Groove” with George Clinton. It’s time to come together through peace and love, so we picked that because we need to unite, even though there’s so much hatred and division and even though the lyrical content can be wacky, the premise is bringing people together. All of it means something. Was there any apprehension for you when you were making the album, considering this is not something your fans would necessarily expect from you? My fans are not used to me talking about these kinds of things. That’s why I knew it would take a while to write it. But these songs address the issues I would have written about, issues like poverty and all the stuff about the National Anthem. And it’s going great when we’re playing these songs. We open up with a funky version of the National Anthem, our version, and if they’re sitting they start standing and singing and we love that. When you go to our shows, you see diversity in the audience. Music brings people together. It doesn’t matter how much money you make or what your status is or who you love or if you’re Republican or Democrat. Our audience is what America looks like, all people, all of the above. Sheila E. takes the stage at 8 p.m. on May 18 at the Golden Nugget Showroom (129 E. Fremont St., 800-745-3000) and more information can be found at goldennugget.com.